The last independent king of Babylon was an Armenian by the name of Arakha also known as Nebuchadnezzar IV. After the Achaemenid conquest of Babylon in 539 BC, several attempts were made by the Babylonians to rebel against the Persian conquerors. The first attempt was led by Nidintu-Bêl and was violently suppressed by Darius the Great. The last resistance however was led by an Armenian by the name of Arakha who after ascending the throne took on the name of Nebuchadnezzar IV. A certain man named Arakha, an Armenian, son of Haldita, rebelled in Babylon. At a place called Dubâla, he lied unto the people, saying: ‘I am Nebuchadnezzar, the son of Nabonidus.’ Then did the Babylonian people revolt from me and they went over to that Arakha. He seized Babylon, he became king in Babylon. Then Intaphrenes marched with the army unto Babylon. Ahuramazda brought me help; by the grace of Ahuramazda Intaphrenes overthrew the Babylonians and brought over the people unto me. On the twenty-second day of the month Markâsanaš [27 November] they seized that Arakha who called himself Nebuchadnezzar, and the men who were his chief followers. This was the last time someone attempted to rebel against Darius the Great. What is interesting about this account apart from the fact that apparently an Armenian man tried to free Babylon from Persian occupation, are the names of the Armenian rebel and his father. Arakha is clearly an Armenian name, it translates from Armenian as ‘crown prince’ and a variant Ara is still a popular name in Armenia. 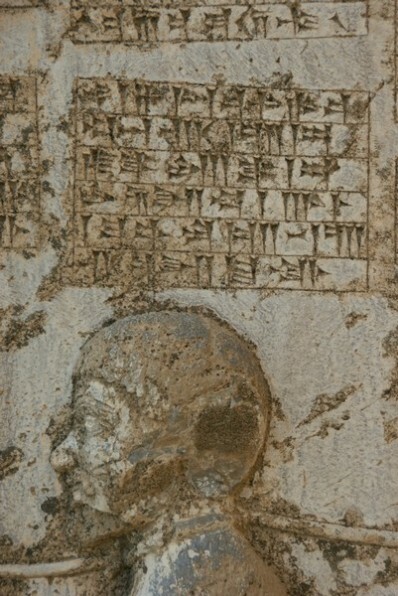 Perhaps more interesting is the name of his father ‘Haldita’ as described by Darius’s inscription at Behistun. It clearly bears the name of the supreme Urartian deity Haldi. The suffix –ta possibly derives from the Armenian “tal” –“to give”. Just as today one would say “Astvats-ta” meaning “God give”, in the olden days when Armenians worshiped Haldi, they would most likely say “Haldi-ta”. Which makes Haldita a “God’s gift”, a familiar name in many languages, f.e. a Slavic variant is Bogdan (God given) or the Armenian variant Astvatsatur. Yet again we observe here evidence of Urartian-Armenian connection. The accounts of Arakha definitely support the hypothesis that Armenians and Urartians were the same people. That the toponyms Urartu and Armenia are merely synonyms for the same kingdom I’ve explored in an earlier post titled “Toponyms Armenia and Urartu“. Additional evidence has been discussed in a post titled: “Armenia the heir of Urartu“. Last but not least, there is recent genetic evidence found in bones of ancient Urartian burials that matches the genetic makeup of modern Armenians. Read more about it HERE, and HERE. Next Article SUPPORT the Paleontological Cave Exploration in Artsakh! I have two questions. Who and where does this newspaper “print” and how close is it to the truth. All the sources are linked in the article and the source section. You can just follow the links to verify this content.